Most people dont realise just how WORTHY they are of the most magical life, and this is because most of us hold a negative core belief (ncb) that we are not worthy of what we TRULY desire. A negative core beliefs is a basic belief about ourselves or the world around us. NCB’s are things we hold to be the absolute truth deep down in our subconscious and are usually created in our childhood when one of our needs were not not met OR we may have taken them on from one of our parents. So although this sense of unworthiness is not true (as we are all completely worthy) it can dictate our lives and hold us back from everything we desire. This lie can be buried so deep within us that we may not even be aware of it and how it is playing out in our lives everyday. A lot of people want to improve their lives and they may read the books, do courses and maybe work on their external appearance, and they may see some improvements but they get to a certain point that they just cant get past, the know there is another level for them that they just arent able to reach. 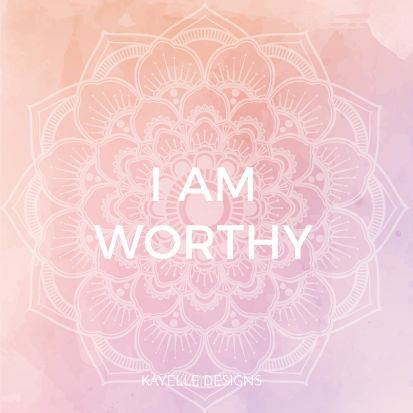 They find themselves stuck, not able to attain that certain level of health, prosperity or deep connections to themselves and others and a lot of the time it can be this underlying sense of unworthiness that is at the core of everything. Of course most of us know on a conscious level that we are worthy but its on a deeper level we need to address this and if we can start to look into this and work on this core issue then everything around us will start to change. Instead of focusing on trying to improve ourselves on many different levels and in different areas, this one is the key to changing everything and as we move into feeling and knowing we are absolutely worthy, things will start to shift and rearrange to reflect our new belief system. We must set our inner bar high and learn to retrain our brains to let go of our unworthiness. Think about how this could be showing up for you in your life? For me i feel it creep in when I am about to achieve a big goal or an doing something new for the first time. It can show up when we compare ourselves to others and we all know that comparison is the thief of joy. So how can we tap into our own worthiness? * Making positive validation a daily practice – morning and night. Tell yourself the things that you long to hear from others, tell your self that you believe in you and that you are proud of you! *Stop comparing yourself to others and trust that you are on your own unique journey and are exactly where you are meant to be…trust THIS! * Ask yourself questions when you feel unworthiness start to creep in : How do I feel? Where is this coming from? What am I believing about myself that makes me feel this way? You deserve to feel the highest level of worthiness in yourself and you are capable of experiencing this right now, this will support you in bringing your dreams to life. Know that this deep rooted worthiness is already within you waiting for you to tap into it, feel it, to peel back the layers to get to it. Take a deep breath and feel how worthy you are right now, exactly as you are. You are made from the same stuff as stars there is no one else exactly like you, nor will there ever be. You are here to do something that only YOU can do! You are so important, you are so worthy and you are so loved. What is Manifesting all about?